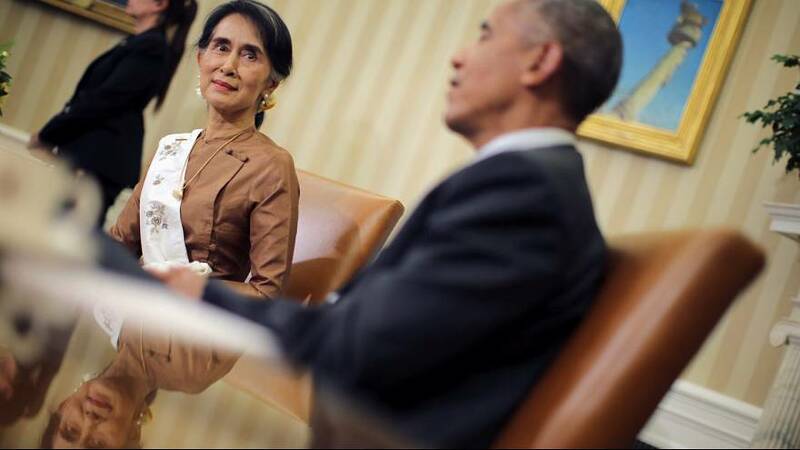 The United States is to lift trade sanctions against Myanmar. The announcement came as President Barack Obama welcomed Myanmar’s de facto leader Aung San Suu Kyi on her first official visit to Washington. It includes reinstating trade benefits for poorer nations, suspended in 1989 by George W.Bush over human rights abuses. “I think this will give the United States, our businesses, our nonprofit institutions greater incentive to invest and participate in what we hope will be an increasingly democratic and prosperous partner for us in the region,” said President Obama. Suu Kyi is president in all but name after leading her National League for Democracy party to victory last year in the country’s first openly contested elections. According to the constitution in Myanmar (formerly called Burma ) she is barred from the role and holds the title of state counsellor. Though many companies will now enjoy lower tariffs, there are some sanctions which remain in place. These include a “blacklist” of at least 100 companies and individuals with links to the former military junta, as well as trade in jade and rubies. A visa ban barring some former and current members of the military from travelling to the US will also remain. On other issues Suu Kyi has been criticized by some rights groups for not doing enough to address the plight of the Rohingya. Some 125,000 Rohingya remain in temporary camps in the country’s Western Rakhine State following violence in 2012. Under the country’s citizenship law, the Rohingya are not recognized as one of the country’s 135 official ethnic groups and are stateless. They are seen as illegal immigrants from neighboring Bangladesh and deeply disliked by many in Myanmar, particularly Rakhine Buddhists.